Draw a horizontal line, six inches long, on a piece of paper. At the left side write Precision and on the right, put Tricks. Now, hold your pen in the middle and move it one way or the other and you will begin to appreciate the problems a designer encounters when trying to get an all round sport kite that will do everything – the closer you get to one – the further you are from the other. Somehow, of course, the other problem that has to be overcome is to make it fly in anything from 2 to 30mph without having to make any adjustments. Pretty impossible task huh? – Well only a few years ago the line you just drew was twelve inches long and some of the modern kites of today have got it down to about four and are now trying to bend it in the middle! Of course these kites don’t come cheap, they are made of the latest, high tech materials and there is a mountain of research hours to be paid for. Remembering the days Tim Benson had been developing his sport/trick kite The Deep Space, and I had watched him tweak it this way and that with different rods, tensions, panels and bridle settings for more than eighteen months getting ever closer to what he wanted the kite to be able to do before he even thought about releasing it. In the last few years Close Encounters have become involved also with Peter Taylor at Airdynamics and have been grateful for each of Peter’s modifications that have made our custom made, yellow and black T4 kites fly a little better in a little lower wind each time. Skyburner always kept their name synonymous with that of good quality build and innovative ideas but, for us, really cracked it when Jon Trennepohl poured his years of experience in to creating the WidowMaker – imagine how he felt when he realised what he had created! Guys like Tim, Jon and Peter put so much time and thought in to getting their designs to work at their very best with some of the tweaks barely noticeable unless you are flying their kite all the time – it’s all down to pride! So, do you need to spend the sort of money these high end kites justify, and what do you look for in a sport kite when you are buying for yourself or someone, not perhaps in to power, but would still like to be having fun flying. At festivals our sponsor, Kiteworld, often send people over, who are interested in learning to fly but have no idea where to start. The easiest thing would be to say “Go spend at least a hundred quid and get something big” but that teaches them nothing. Instead I take them through a familiar pattern from which I can predict – I will always get the same reactions. I start them off on a small kite – something around £30 to £40 which has low pull and needs a little bit of wind to get it going. 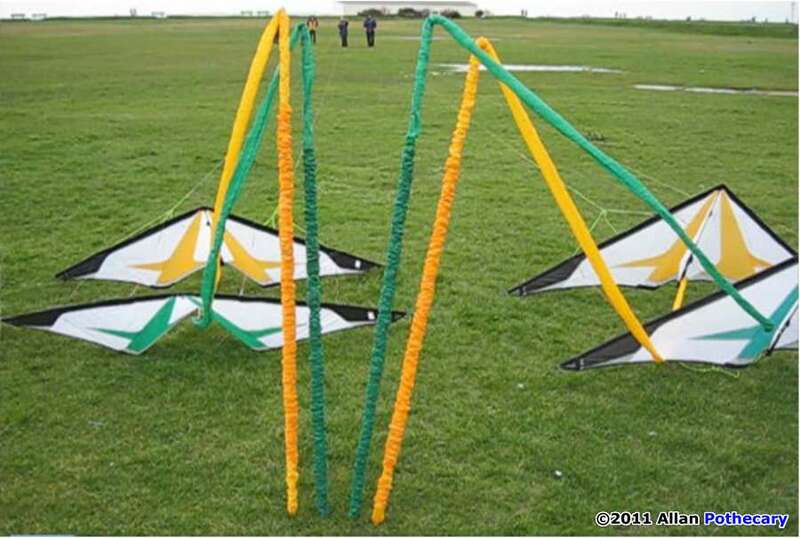 These are usually quite difficult to fly at first but make good training and if, as usual, they are a bit quick then I’ll put a tail on the kite which will also make it more stable and concentrate the flyer’s mind on keeping it in the air. Something like a Bolero, Nexus or Bebop kite has the strength to stand up to some good bashes into the ground here. Basic stuff of how not to do it (and try not to hit anybody/thing) is followed by how to launch and what to do to correct the Kite’s flight path to keep it flying and then a quick demo by myself or my wife Marilyn just to prove that it is all possible. As soon as they are confident enough and before they decide that they are going to head off to the world championships with this wonderful little beast, I deprive them of the kite and put in their hands something like a Prism Quantum (not the Pro), which has a shock absorber built in to nose, something like one of our older Overs or and HQ Falcon. I love the look on their faces on launching as they get their first experience of – “All kites are not all the same!” and they can feel the firm pull and much better controllability. So I put them back on it and the usual comment is about how wishy-washy it now feels and that maybe a more expensive kite is a better investment. There aren’t too many kites around the £70 to £100 mark that will deliver tricks, precision and fly well enough to take you on to the next stage, but a larger kite chosen carefully usually means that you can fly in much lower winds and will be much slower and easier to control when the breeze freshens. The sail will be better quality though probably not the best available and most manufacturers are now using higher grade, stiffer and lighter rods such as Skyshark or Avia (Skyshark now label all their rods) so that is another thing to look for in a better quality and probably better flying kite. There are some kites at around the one hundred pound mark I would thoroughly recommend as a first or second kite purchase or even to use in pairs or team flying but if you want real class then it’s going to cost more. Even the inexperienced eye can spot the difference between a high end kite and a cheapie if you stand them side by side, and believe me – you do get what you pay for! Don’t be influenced by the colours – like “Go Faster” stripes on an old banger – performance will not be enhanced by livery. I have to say that there are some kites I have found to fly really well but I don’t feel happy flying them because they look awful – and I am not alone here so manufacturers take note when you wonder why you kite isn’t selling as well as you had hoped! It’s a bit like clothes – if they make you look good you feel good. When was the last time you saw a good trick flyer ordering a top end kite and asking for one with a picture of Kermit on it? We do keep with us quite a selection of mid range kites, so if you want to try before you buy then look out for the “Close Encounters” banners. The kite that’s always in our bag and, in our opinion, the best trick kite, is the Benson, Deep Space. You are always welcome to come over and give this one a try – You will not be disappointed! Then, of course, are the kites we use in demonstration. The ones we have been really fussy about are the super ultra-light, Airdynamic T4 kites designed by Peter Taylor – as said above, these have been really tweaked. This is because we want to be able to fly and demonstrate in the lowest of winds possible – we hate letting people down and we hate going all the way out to a practice session and we can’t fly through lack of wind. 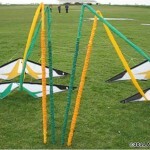 These kites can be bought to order – we had ours in special team colours too! We had super light tails made first and then got the kites done in the same colour – the tails are so light we can still fly in virtually no wind – and they are over 100ft long! After that we use standard kites by well known manufactures such as HQ (the Skydog Dream On has a pretty good wind range) or Eolo Gayla – here we get sponsored a bit (mostly by HQ) but the kites are as anyone would buy off the shelf and we don’t tweak the bridles any more than the standard, built in adjustments allow. In higher winds we use Nappy brakes, Wah pads or vented kites. In pairs we have two of our old competition kites (Lithiums) with removable panels and when there are three of us we now have three HQ Invento Vented Infinities. 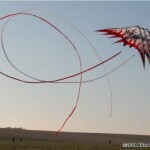 You can see lots of videos of all types of kites flying in the video section of our web-site. We’ll be happy to recommend traders you can trust but if you tell them what you want for a kite and how much you can afford you would be unlucky to get ripped off. A good trader will tell you honestly what you get for your money and should be there for you with after sales service. They know that you will come back there for your next kite if the first one was a success. There are not that many people new to the kiting scene that will be able to tell you much about Dodd Gross because we have not seen much of him in the UK lately. Dodd was one of the pioneers of dual line sport kites, a very advanced trick flyer of his day and absolutely passionate about kites. He still runs Kite Schools where people band together and book his services thus enabling him to tour the world coaching peoples at all levels in the art of kite flying. I last spoke to him about four years ago, not that he would remember, and there is a photo of that on our web-site, “Kitey People” page. The kite Mr Gross was probably most famous for was “The Jam Session” a kite, just now re-released as part of the Retro Range from HQ Kites. 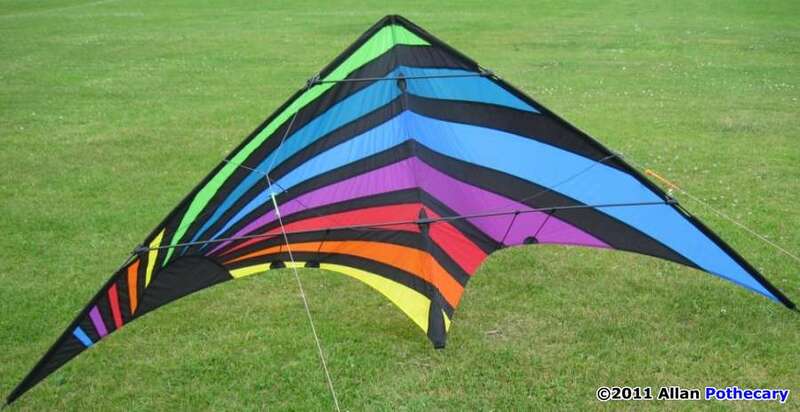 This is still a great fun Kite to fly and I will be doing an article on it soon. Currently Dodd is part of Skydog Kites who produce a whole range of kites from a kiddie’s single line through to some serious power. One of the sport kites, the Dream On, caught my eye with its stunning graphics. Kiteworld sent us one to try, and we liked it! 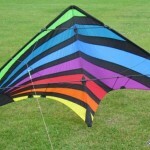 The kite has low pull and flies in a wide wind range. The makers claim that it is a full size kite but I have to disagree. It flies like a big kite and it will pull tails as they say but it even at the 87 inches wing span they have on the label the high aspect ratio does not, in my opinion, make it big enough to meet that claim. There are advantages to the size and shape it is. It does not whizz away when the wind gusts and it is easy to power up again if the wind drops suddenly. It looks a bit small on the end of our 125ft lines without tails but if space was restricted we could easily still fly on 100ft lines or maybe even less because it uses most of the available window and it is small and slow enough even to fly in a team of three on 100ft lines. I was performing some basic tricks like axel cascades and Lazy Susans on long lines so there is obviously some versatility there on the shorter line set supplied in the bag. The instructions are hidden away and fold out on the back of the label but as I have said many times before – us men don’t need instructions do we!? There are two settings on the bridle which can be easily transferred from one to the other. By loosening the knot and sliding it over the other one. We usually prefer the team setting on bigger kites but the more solid feel given by the offset (‘Turbo’) position helped towards a ‘bigger’ feel. The Dream On lands easily too – another plus in my book! Because of the low pull I was flying on lighter, 100lb lines and would be able to move up to heavier lines to provide the drag I would want in a stronger wind without having to use nappies. I would still recommend that anyone should try my rubber band across the T-piece tip (not a new idea) to keep the bottom spreaders from falling out in a heavy landing or groundwork. Framed with 6 mm carbon and, most probably made in China, the Dream On is not in the expensive bracket of kites, retailing at around £80.00 and, appearing to be fairly rugged, it could be a good first or second kite to own or great and fairly inexpensive for anyone wanting to learn the basics of pairs or team flying. Those of you that have seen Close Encounters at a few or more festivals will have noticed that we have a large collection of different types of tails to use depending on the prevailing conditions. I say different types not just meaning the many different colour schemes often coded to the kites that are pulling them across the sky but the way they are made, stored away and set up ready for launch. In the photo below is an example of just a few of our tails, there are more in the garage – all are in pairs and some there are three, or even four of the same colour! Tubes don’t seem to affect the drag anymore than flats, nor does the fact that they are inflated, nor even the fact that they are filled with air make them lighter. It’s just the overall weight that makes the difference the more material used, the weight of the material and the length of the tail all combine to hinder or aid a flyers performance. In high winds tails don’t act as a brake for the kites. They pull just as hard and the less experienced flyer should avoid practicing near people, car arials, trees and fences. It’s easy to forget how far out behind the kite tails flow. At the first Margate festival where the arena was quite small it was only the quick thinking of Bryan from Team Spectrum (Great users of tails themselves with dramatic effects) who saw that my tail had wrapped itself around a banner pole and just grabbed the tail to prevent me from launching and, possibly, taking the pole into the air at the same time. We still get reminded of when Marilyn did the impossible after a huge gust ripped the kite from her hands at Weymouth one year and dumped kite and two 100foot long tails in the sea. The feat, never to be repeated, was to re-launch all from beneath the water, unaided. Nearly all the tails we fly are over 30 meters (100ft) long we have some half that length which we use for practice, in really small arenas and on two of the stacks we have. These can been joined together which is fine until they ride over each other when we do a sequence of tight turns and then catch and lock together at the join! We fly on lines 40 metres in length so much longer would be a bit of a struggle and remember that we use mostly full size team kites to pull them. We once made a beautiful pair of colour coded tails to exactly match two Tramontanas, one in gold/black and the other in purple/black. The big problem here was that by the time there was enough wind to get everything off the ground, the kites pulled too hard to do anything with them safely. Which type of tail do we prefer? They both have advantages. 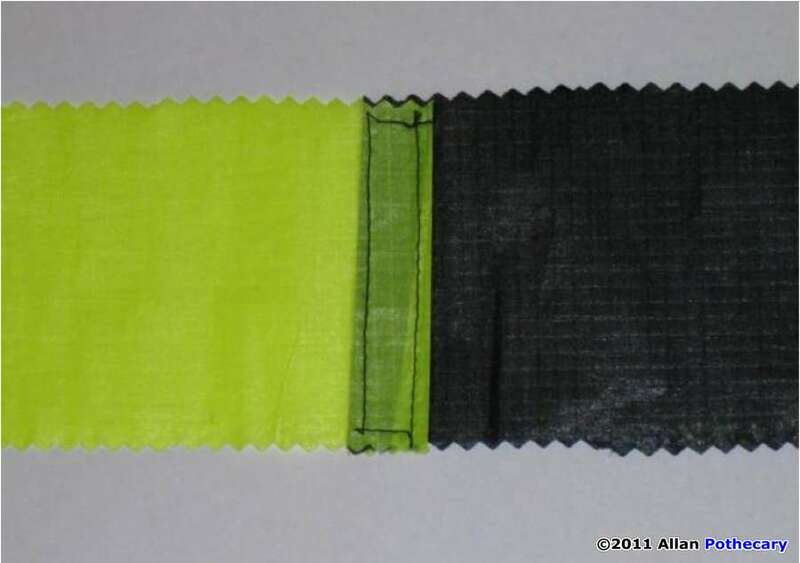 Flat ones will fly across a bigger wind range – the specially coated yellow and black ones (team colours) that we use for our Conte routine, are extremely light-weight but take forever to wind back up – especially if they get twisted (volunteers always welcomed). Team Spectrum have some that they fold, concertina fashion, into boxes. Tubes take longer to make and use up much more room in the bag but they can be scrunched down on to poles providing they are not sealed at on end. These look really spectacular to anyone stood just behind them when the take off – always worth putting the camera on to video. Marilyn reduces the size of the hole on the trailing end making it a tighter fit over the pole and we use a rubber band to automatically close the end of tube after it has slid off the pole. You could just start at the tip of any tail and scrunch it back in to a bag and peg the bag to ground next time you launch but we found this a bit risky when doing public displays because you can sometimes end out with a bit of a knot in one or the other. Sometimes we push the poles in to the ground and let the tails get pulled away by the kite but if the ground is too hard and the poles can’ be pushed in hard enough there is a danger that they could be lifted high in to the air before being dumped on some innocent person. What we found to be safer was to drill a hole in the bottom of the pole, put a loop of cord through it and then secure the cord firmly using a tent peg or similar. Use a cut up floatation sleeve – the type you see kiddies using in swimming pools especially on holiday abroad – or some water pipe isolation sponge to help with rolling the tails back up afterwards – the sponge won’t hurt anyone if it falls on them – but I suppose in this PC age we should write on them a warning that they are not to be eaten! If you don’t fancy making tails and can’t find a trader with any long ones in stock – an idea we have employed was to use barrier tape – the sort you see around road works. Six or seven pounds will buy you about 300 ft from one of the large DIY stores or a builder’s merchant and it’s OK for a few trips out until it becomes too twisted. Try rewinding it on to a large piece of flat cardboard. It usually comes in either red and white or black and yellow (C.E. team colours – handy that!). We find making tails extremely laborious, boring and frustrating. After every set we say never again and yet every year we seem to be producing more. Marilyn does all the sewing, the biggest part, and hates it more than I do, but it’s good when it’s finished – mind you so is banging your head against the wall! 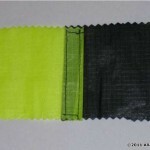 We get the rip-stop nylon from kite traders who usually have a good range of colours but sometimes not so much in the really light stuff like Icarex. We sometimes go to sailcloth shops (where all the “Yachties” go) good stuff but expensive! Don’t forget that you will need a good amount of polyester thread! Flat tails are about seven centimetres wide. We cut them with crimping scissors to prevent fraying and sew them over at the end but if you were really clever you would use a heat gun (something like a soldering iron) to seal the edges properly. I was going to make a joke here about doing this on the dining room table and see what lovely patterns you make but in this silly world these days – perhaps I won’t! The cloth comes in either one or one and a half meter wide rolls – you do the maths but the longer you can make the strips the less sewing together you do! For the smallest of tubes strips of eleven centimetres wide is good, sew all the strips together to the length you want then fold it in half and sew 5mm in from the edge. If you sew as well as me go twelve centimetres wide , fold in half and allow for a bit of wobble with a fair bit of swearing and unpicking – I don’t do fiddley! I have known people to lay a piece of string through the sail as they go and when they get to the end, attach it and then pull all the way back through to turn the tail inside out (or with the outside now to the inside). I have no idea if this way works. What we do is to sew the end of the tail get a long piece of sturdy dowelling and push the tail down over it. Just after starting this method and about halfway through, you begin to get doubts if this is actually working but keep going! When you are eventually through, you need to cut off the end and re-hem it if you are going to use poles to store and launch. Now you need to figure out how best to attach your masterpiece to the kite. To keep the end open we use a small cut-down plastic bottle held in by folding the end of the tail back through it and holding it in place with either glue or staples. (If you prefer to have the wind run right through). I then use a soldering iron to make a couple of holes to put some line through and attach that to one end of a sturdy swivel. Tie a loop of string around the centre T of the kite and attach the swivel to that. Don’t tie your tail to the bottom of the kite because the drag of the tail will alter the angle to which the kite presents itself to the wind and it may not lift as easily or fly as well as it should. Please remember that you will be taking up a lot more space in the park now and all those other people have as much right to be there as you – unfortunately! 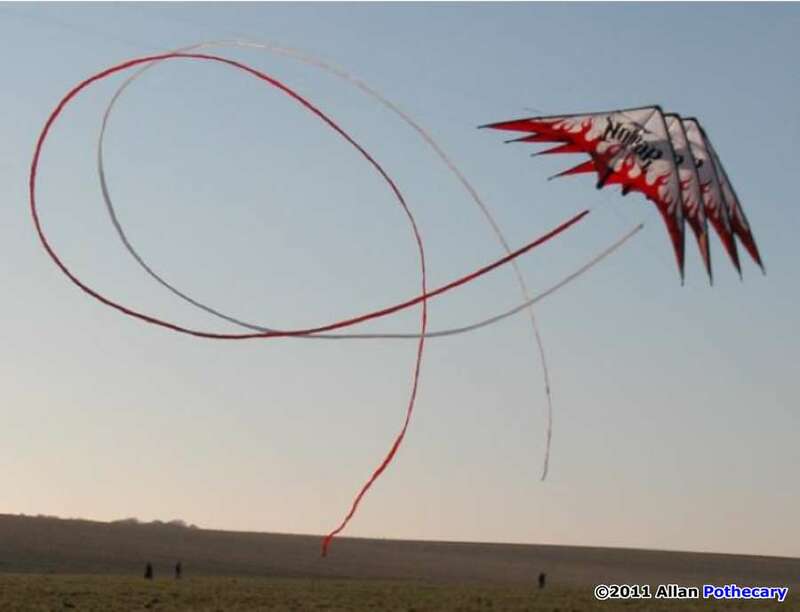 By the time this article is published there will be some short video clips on our web-site of tails launching go enter three separate words – Close Encounters Kites in to your favourite search engine (mine is Google) and look in galleries/videos/tails launches. Or, you could always come along to a festival, see them in action and be a volunteer winder upper when we’ve done. I know that all of the flyers we know who demonstrate with tails take a lot of time in preparing routines that really do paint pictures in the sky and the only real place to see the display properly ids from behind the flyer – that way you get to see what he does! Think about it – if you went to an art gallery, you would not view the paintings from the side, you would stand where the artist did when he created it! 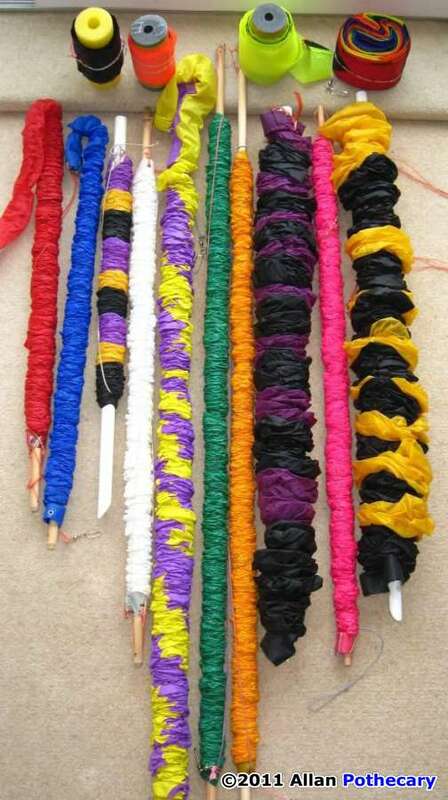 Below is a stack of four large but inexpensive kites pulling two of the tails mentioned earlier with joins in the middle. Each tail is now just over 100ft long. The pull was so strong that it broke the bridle on the lead kite shortly after this picture was taken. 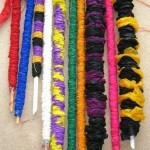 This article was inspired by a lady who wrote to us asking if we would make her some tails or at least give some hints on how to go about it. Sorry but I was joking when I said before that Marilyn enjoyed making them – hence these three pages – thinking on – it would probably have been quicker to make the tails! If we have left any questions unanswered, please feel free to contact us and we will see what we can do. This entry was posted in 2011, General Topics, Issue 77 (Mar/Apr), Kite Columns, KL Archive and tagged buy, sport kite, tails.